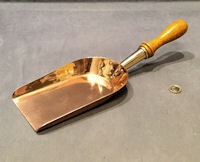 Original, quality near unused 1920's coal box shovel or even possibly a banker's money shovel used for bagging up coinage ?. This superb example has a thick gauge copper scoop, a cast brass stem and the original turned honey coloured oak grip in the original finish. A good solid shovel well above average. Polished and lacquered, although the lacquer may be removed at no extra cost and complete and in good and working order. 14.5" x 4.75" x 3.25". 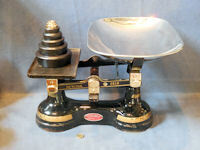 Original, quality 1920's small nickel plated letter scale manufactured by "Salters". This very clean example has a steel clip hanging beneath and a white celluloid face detailed from 0 to 4 ounces. A very simple letter balance. Complete and in good and working order. 4.25" x 1" x 0.25". Original, quality 1920's brass postal balance of the pendulum form. This example is calibrated in ½ ounces up to 4oz, the front is enamelled in white and the pointer and above is in polished brass finish and lacquered, although the lacquer may be removed at no extra cost. The reverse is impressed "Foreign" and the steel clip to the right is for holding the letters. All is complete and in good and working order. 4.75" x 2" wide x 0.1" front to back. 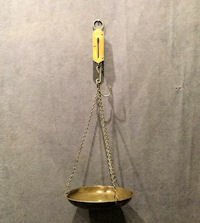 Original, quality late 19th century brass letter scale of the pendulum balance form. This example is calibrated in old pennies and ounces and is for the postage rates from 1885 to 1897 and has the original steel letter clip and top split ring. 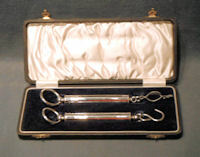 The pendulum is impressed for the manufacturer "Perry & Co London". Originally nickel plated with traces still to the reverse and now polished brass and lacquered and complete and in good and working order. 6" x 3.25" widest x 0.5" front to back. 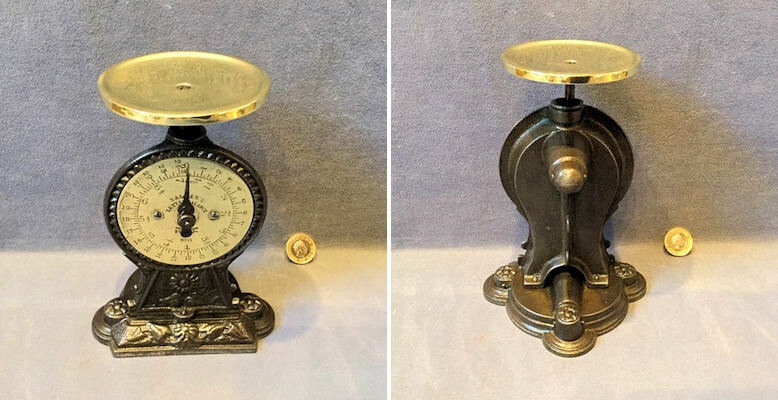 Original, quality 1920's /30's scale with a very decorative cast iron body, a brass face and brass top plate. The brass dial is detailed "Salters Letter Balance No11" and is calibrated in ounces and parts of and the postage for the years 1923 to 1940. All has been cleaned and lacquered, fully overhauled and is complete and in good and working order. 7" tall, base 5" wide + 3.75" front to back. Pan 3.25" diam, total 4.25" front to back. 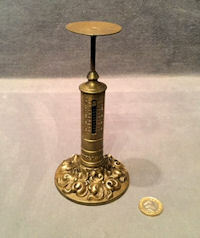 Original, quality brass postal balance of the candlestick form with a decorative pressed brass circular plinth, a cylindrical body and a small circular sprung plate to the top. 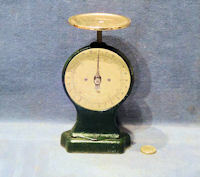 The body is embossed for the manufacturer "R.W Winfield Birmingham" and the scale is calibrated to weigh up to 4oz for the years from 1840 to 1870. All is in the original unpolished finish, fully overhauled and complete and in good and working order. 6.5" tall and 3.25" diam of plinth. Top pan diam 1.75". 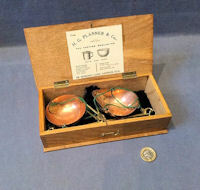 Pair of original, quality, pre-war, nickel plated tubular spring balances, in the original blue velvet and white silk lined leather look paper covered box, with a hinged lid and a pair of clasps. 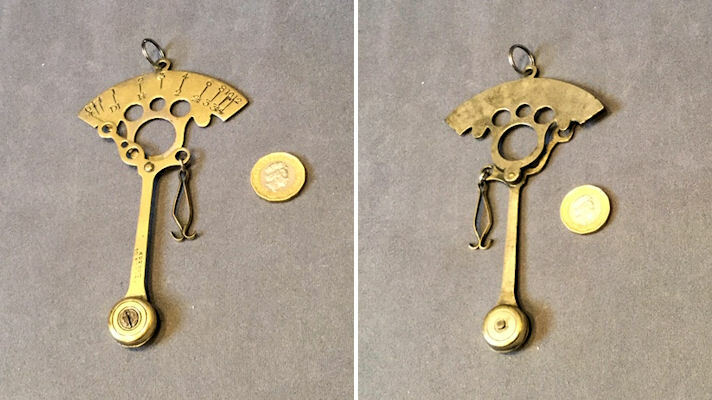 Both these balances are stamped for the maker "Salter" and the one with the spring clip, presumably for letters, is calibrated in ounces up to 16oz and the other, with a hook for parcels? is calibrated in pounds up to 15lbs. All is in near mint condition, probably not seen action and both balances are complete and in good and working order. Case 9" x 3.75" x 1". Price is for the set. 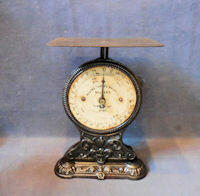 Original, quality, late 19th century, cast iron parcel scale to weigh up to 7lbs calibrated in ounces. The cast iron body is decorated in relief, to the front and base with designs of acanthus leaves. The circular painted face is marked "Salters Postal Parcel Balance No 35, 7lbs by 1oz" and has the postage rates for the years 1883 to 1886. The top rectangular flat pan is in brass and all has been cleaned and lacquered. The detail to the face is rather faded in places, otherwise all is complete and in good and working order. Top pan 6" x 4", total 8.5" tall, base 6" wide and 4.75" front to back. 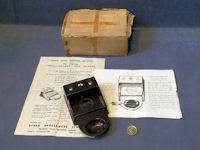 Original, quality post-war Bakelite egg grader in the original carton and with the original printed instructions (2 sheets). Although the box is scruffy the scale is in mint unused condition and complete and in good and working order. Scale 5.5" x 3.5" x 2" tall. 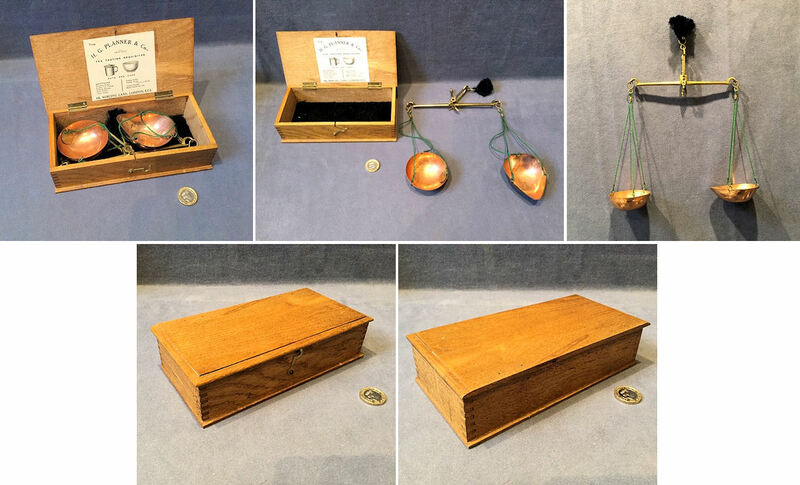 Original, quality 1920's all brass grocer's / chemists' shop counter scales on the original rectangular shaped mahogany plinth with a stack of old circular brass weights from 2lb down to half an ounce. This brass 'beam' scale will dismantle into ten pieces, plus the weights to ease storage. All has been polished and lacquered, although the lacquer may be removed at no extra cost. Fully overhauled and complete and in good and working order. 22.5" tall + base 20" x 10" x 1.25". Total length 21" and weights 3.5" diam + 3" tall. 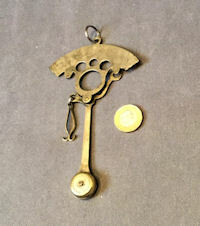 Original, quality 1920's brass faced pocket balance with the original steel chains and tin pan; all appears unused. The balance is calibrated in pounds up to 25lbs. All has been polished and lacquered, although the lacquer may be removed at no extra cost and is complete and in good and working order. Pan 7.25" diam x 1" deep. Scale 8.25" including hook. Total length including chain 20". Original, quality set of 1920's cast iron grocers' shop counter scales of the 'beam' form. In the original paintwork with a set of stacking brass weights to suit. The scale is detailed for the manufacturer J&J Siddons of West Bromwich and all original with brass chains and fittings and enamel pan. The weights were not original to the scale but are of a similar age and the correct type and calibration, 2lb down to ¼ ounce. The brass has been polished and lacquered, although the lacquer may be removed at no extra cost. All has been fully overhauled and is complete and in good and working order. Scales 17" tall, 19" x 8" including pan. Weights stack 3.25" tall and 3.5" wide. 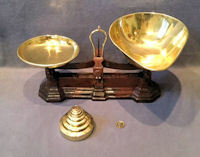 Original, quality 1920's brass based sweet shop counter scale with brass pan and scoop and a full stack of eight circular brass weights from 2lb down to ¼ ounce. 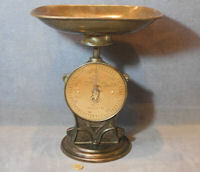 The scale has two labels attached detailing "To Weigh" and "4lbs" a circular brass pan for the weights and a pears shaped brass scoop. All has been polished and lacquered, although the lacquer may be removed at no extra cost and is complete and in good and working order. This is the first we have seen of this model. Base 13" x 3.25" / weights 3.5" x 3" tall, total including pans 15.5" x 9" and 7" tall. Original, quality 1920's unused brass tea blender's beam scale in the original lacquered finish and in the original oak box. All is in mint condition as the day is was issued. The label to the inside of the lid is for the manufacturer "H.G Planer & Co of 16 Mincing Lane London EC3". The scale is truly in mint condition with green silk ropes, black silk top grip, original lacquer finish and the counterbalance weight. Complete and in good and working order. Box 8" x 4" x 2" and beam 7". Price is for the set. 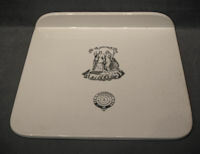 Original, quality late 19th century circular white ceramic scale slab with transfer decoration in black for the scale manufacturer " Henry Pooley and Sons Ltd of Birmingham and Fleet St London". Originally from a dairy scale for weighing butter, cheese and cold meats etc. In super condition and ideal for a cheese board or similar. Complete and in good order. 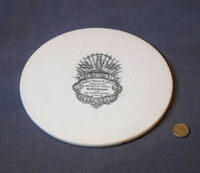 9" diam x 0.5". Original, quality Salters' cast iron kitchen scale with a circular brass dial and a lift off oval shaped steel pan. 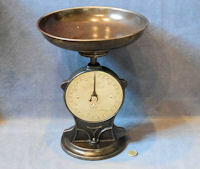 This circa 1900 example is calibrated in half ounces to weight up to 7lbs. The cast iron base and pan have been cleaned and lacquered, and the brass face polished and lacquered, although the lacquer may be removed at no extra cost. Fully overhauled and complete and in good and working order. The brass face is detailed "Salters Class II Improved Family Scale No50" and "Sylvester Patent". Pan 11" x 7.5", base 6.75" diam and total 12.5" tall. 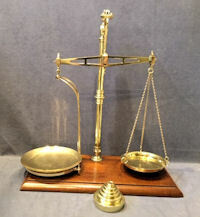 Original, quality cast iron letter balance, with a brass dial and top letter tray. 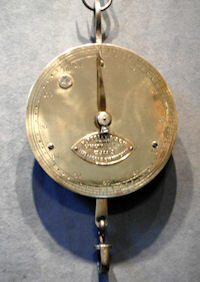 The dial is calibrated to 24 ounces in ¼ ounce divisions for the years 1923 to 1940 and is impressed for the manufacturer " Salters " and " Letter balance No 11 " and " Made in England ". The body has retained a green stippled paint finish and the brass has been polished and lacquered, although the lacquer may be removed at no extra cost. All has been fully overhauled and is complete and in good and working order. Top pan 3.25", total 7.5" tall, base 4" wide and 3.5" front to back. Original, quality 1930's set of cast iron grocers or greengrocers shop counter scales in the original paintwork with brass caps to each rocker, the original strainless steel pan and a stack of original cast iron and brass circular weights. 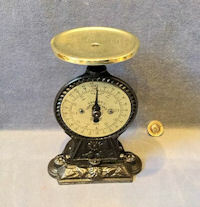 The scale is decorated with gold lined detail and "to weigh 28lb" and has a red on nickel maker's plate for "Wilcox and Walsh London N16". The stack of weights comprise the 4lb, 2lb, 1lb, 8oz and 4oz in cast iron and 2oz, 1oz and 1/2oz in brass. All has been cleaned and lacquered, fully overhauled and is in good and working order. A super set of very usable scales. Scale pan 14.25" x 10", total 17" x 14.5" x 11" tall, base 14.5" x 5" and stack weights 4.25" x 5.25". Price is per set. Original, quality 1920's, hanging trade balance with a circular cast iron body, a brass dial, a wrought iron ring to the top and hook to the underneath. The ironwork has retained much of its original black paintwork and the brass face has been polished and lacquered, although the lacquer may be removed at no extra cost. The dial is calibrated "1lbs" up to "300lbs" and is detailed "Salters No 20 Spring Balance", "Made in England" and "Sylvester Patent". Fully overhauled and complete and in good and working order. Total length 19.5" and 8" wide. Dial 7" diam and 2.5" front to back. 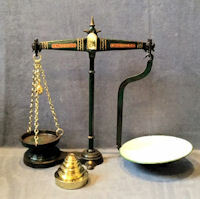 Original, quality, late 19th century, set of butchers' / grocers' shop counter scales with a ceramic slab, a cast brass plate for the weights on a marble topped oak main body and a full set of eight Avery flat and circular brass weights. The oak body in the original finish has transfer decoration detailing "W & T Avery Ltd" and "The Imperium Scale". The weights are mostly marked for "Avery" and are from 4lb down to 1/2oz. 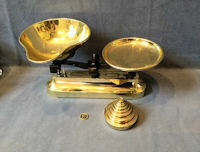 These superb scales have been fully overhauled, all the brass has been polished and lacquered, although the lacquer may be removed for no extra cost and all is complete and in good and working order. Base 20.5" x 10.5", total 10" tallest, 11" ceramic slab widest. Price is for the set. 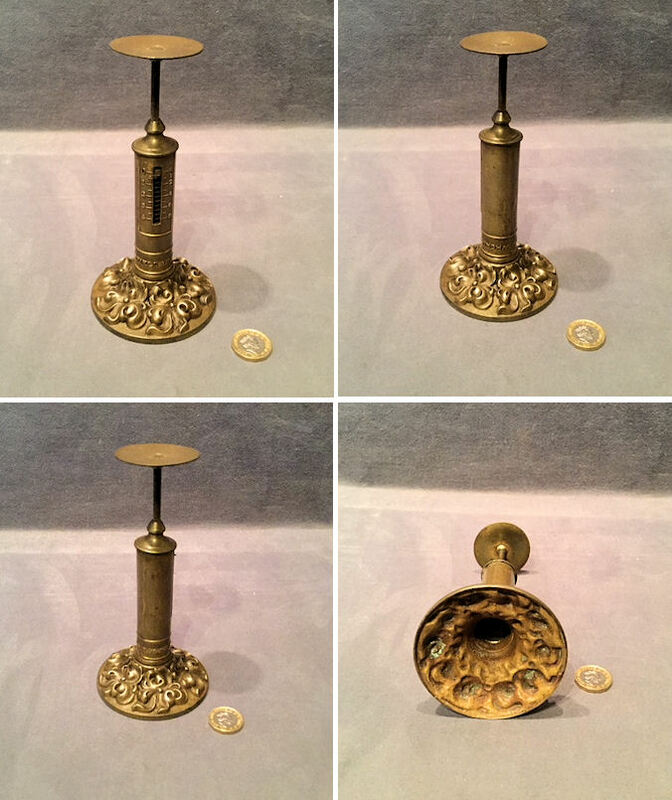 Original, quality 1920's, cast iron hanging trade balance with a brass dial calibrated from 1lb to 200lbs in lbs, has a swivel iron hook to the lower section and a wrought iron ring and hook to the top to hang it with. The brass face is detailed "Salters Trade Spring Balance No 20T", "Made in England" and "Sylvesters Patent". All has been cleaned, polished and lacquered, although the lacquer may be removed at no extra cost. Fully overhauled and is complete and in good and working order. Dial 9" diameter, total 24" long + 9.5" wide + 2" front to back. 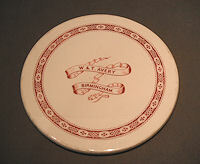 Original, quality, late 19th century, circular white ceramic scale slab, with transfer decoration in red for "W & T Avery Birmingham Scale Manufacturer" in a ribbon decoration and with a detailed circular border. These were originally from a dairy scale with matching ceramic weights manufactured around the same period. Perfect and most unusual to find, ideal for a cheese board or similar. 9.7/8" x 3/8". Original, quality, late 19th century, circular brass balance to weigh 112lb and calibrated in 1lbs. This most unusual example has a thick brass face mounted on a cast iron body, with a ring to the top for hanging and a swivel shackle beneath. The dial has an applied maker's plate detailing "H Pooley and Son Ltd", "Capacity 112lbs", "Class 3" and "Liverpool and Birmingham". The front also has a clear lead custom seal. The reverse also has an applied brass plaque detailing "Pooley and Son Liverpool" and "L&NW 3275", (L&NW' for 'London and North Western Railways). All has been cleaned and lacquered, although the lacquer may be removed at no extra cost. Complete and in good and working order. Dial 8" diameter, scale 14" long and 1.5" front to back.